On August 2, 1941, Raymond and Muriel Peters welcomed their first beautiful red haired daughter, Carolyn Lee, into the world. Little did they know that Carolyn would follow in their footsteps and become a rock of the community as well as demonstrate her musical talent as she played the piano and organ for Payne Memorial United Methodist Church for over 50 years. Carolyn graduated from Cumberland High School and Richmond Business College. While in high school, she began working as Clerk of the Court for the Supreme Court of Virginia in the Cumberland County Combined Court System and continued to work as the Clerk of the Court for the next 58 years. She enjoyed helping people as they entered the court system for a variety of issues and, especially, enjoyed performing weddings. Upon her recent retirement, the Supreme Court of Virginia honored Carolyn at a special service in Richmond that was attended by clerks and judges from across the Commonwealth. Carolyn loved her family and her community and was loved by them in return. 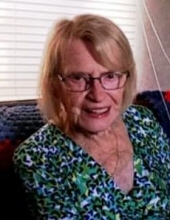 She served on numerous community and regional boards. Richard Gallagher, and other family members. The family will receive friends at Center Presbyterian Church in Cumberland on December 8, 2018, from 1 to 3 p.m. A service honoring her life and memory will be held at 3 p.m., followed by interment in the church cemetery. The family requests that memorial donations be made to the Cumberland Volunteer Fire Dept. Auxiliary at 22 Ivy Lane, Cartersville, VA 23027. Puckett Funeral Home is serving the family. www.puckettfh.com. To plant a tree in memory of Carolyn Zirkle Helgeson, please visit our Tribute Store. "Email Address" would like to share the life celebration of Carolyn Zirkle Helgeson. Click on the "link" to go to share a favorite memory or leave a condolence message for the family.